- Slightly steampunk, and entirely enchanting, this bronze pendant is sure to capture your imagination. Just as the heart holds your passions and desires, the wings represent the ability and drive to follow through on your dreams and accomplish all that you are capable of. Pendant has a wingspan of approximately 1 3/4". Hangs from a 33" black cord. 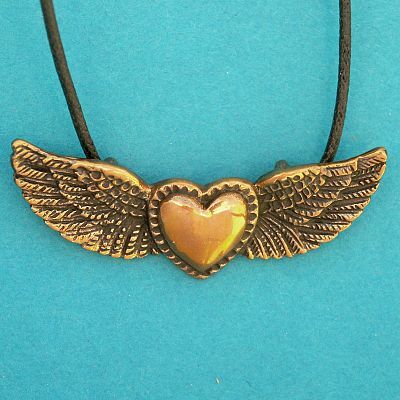 Do you have any other questions about our Winged Heart Bronze Pendant?